The Misinformation Highway has a Pile-up on Bryce Harper and Manny Machado! They say the internet is the information super highway, but like any good propaganda expert can tell you, the misinformation highway can be very effective also. The rumors surrounding both Bryce Harper and Manny Machado who are sought after by some of the same teams (reportedly) have become part of the daily headlines for weeks as they remain the highest ranked free agents ever in terms of dollar potential. USA Today columnist Bob Nightengale has been putting out accurate and inaccurate information for years, and every once in a while the facts come out to either prove him right or wrong or in this case last night, a very upset agent went public to refute reports on Nightengale’s and Buster Olney’s Twitter. The Phillies could sign Dallas Keuchel and Craig Kimbrel now if they wanted to. Why don’t they? If the #Nats exceed the CBT of $206 MM it's a 50% tax & from $226 MM to $246 MM they're subject to a 62% tax. If they exceed by $40+ MM are taxed at 92.5% on 1st time & a 95% tax if they exceed it by more than $40 MM again the following year(s). Where did Jayson Stark get this baseball official from? 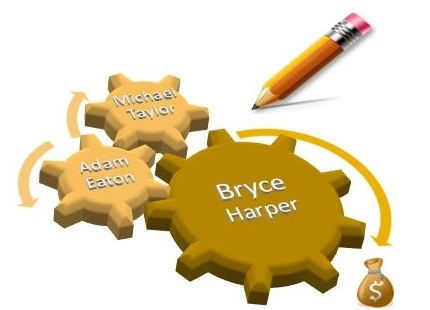 Are the Nationals planning on now going over $246 million in payroll this year to get into that “90% tax brakcet”? The Nationals payroll that Cots and TalkNats have put together has the 2019 salary commitments between $195 to $196 million plus reasonable you would want to add $6 million in incentives so let’s say the real number is $202 million. In order to get to the 92.5% tax level as defined by the CBT, general manager Mike Rizzo would need to pay Harper and others an AAV for 2019 of over $44 million. That does not seem likely. The goal today is staying under the $206 million CBT cap and paying no penalty. If the Nats go over the cap and up to $226 million they would pay a 50% tax on the excess and 62.5% if they spent over $226 million to $240 million. Those are factual cap level adjustments. You don’t need a baseball official to spread unsupported numbers. Equally, you don’t need writers hitting the enter button on the misinformation super highway where you get that daily pile-up.